BEING as this is such a beautiful and well-beloved quilt design, we have selected it to have cut, all of the 968 little diamonds exact size and true with the weave. This comes in a glorious rainbow assortment which starts with red for the center star, then orange, peach, yellow, green and blue for the largest circle of color, blending back again through the same hues and ending with red tips on all of the star points. Every alternate row is white. 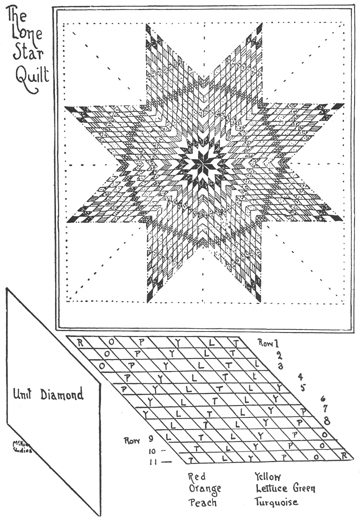 The large white triangles which complete the quilt center are determined by the size of your large pieced diamonds. 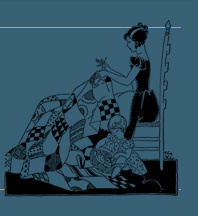 Borders may be added in the proportions shown, to make this quilt longer than wide. All of the small diamonds in white and the six colors named come ready-cut, together with material enough for the white triangles and borders. 299M Ready-cut Diamonds and Material for Corners and Border for Lone Star Quilt, $4.00.